Instead use the updated hack tool to get unlimited simoleons on SC Buildit. To get the hack tool you can visit this page. First of all I’d like to thank Reddit user Seyeght for coming up with this method. 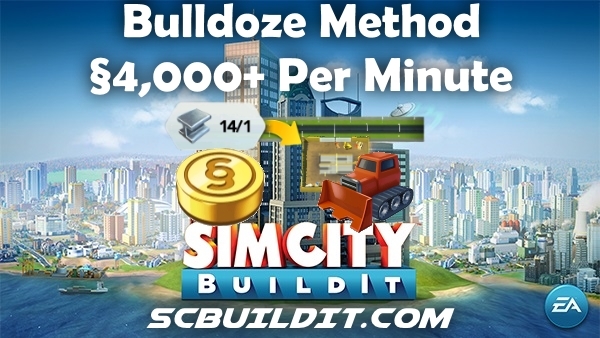 We already knew about bulldozing methods to make §Simoleons fast in Simcity Buildit, but this method seems to be the fastest and most efficient way to earn money quickly. This method works 100% of the time, if you do it right. So it’s important to follow each step perfectly or it won’t work. Later this week we might make a video tutorial about it. If you do not want to bulldoze your city and start over; this guide is not for you. Bulldoze all your residential area’s and make 100% sure they are no residential area’s left in your city. Your population should go back to zero. You do not have to remove police stations, hospitals or any other services or factories. Only residential blocks. Note: If you have done Dr.Vu disasters, they count too! You have to removed demolished zones or this method won’t work. After you city does not longer have residential zones, you start by building 2 residential zones. It will look like this. One of the zones will require 1 nail to upgrade, the other will require 1 metal to upgrade. Do not upgrade them yet, first go to step 3. In step 3 you only upgrade the zone that requires 1 metal. DO NOT upgrade the nail residential zone. In fact, you can just move the residential zone that requires 1 nail to somewhere else because we don’t use this one. But keep it in your city. Now quickly go to step 4 & 5. Fireworks go off when the first zone is done. You’re still in the residential screen and within this screen you just press and hold on the first zone and tap bulldoze it. By bulldozing the first 1 metal residential zone we exited the residential screen. And you will see the building you created in step 5. It will require 1 metal, every time. Now you can upgrade the zone you created in step 5 for 1 metal. And after you upgraded this zone you go back to step 4 and repeat the process over and over again. Every time you upgrade building you will receive at least 700 Simoleons. If you speed up this process you can do this about 5 or 6 times a minute. Earning you 3500-4200 Simoleons a minute. 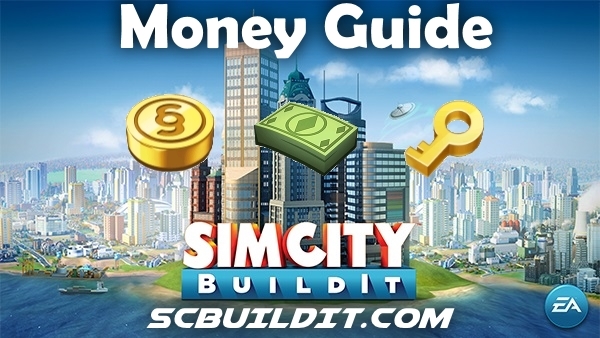 Now you can build the city you want in Simcity Buildit. Not too bad right? If you repeat these steps for an hour or two you can make a easy money and rebuild your city with a lot more money. I hope you enjoyed this tutorial guide and if you have any questions or feedback, please let us know in the comments below! EDIT: Be sure to have some nails on hand in case you slip up and have to start over. EDIT 2: IF your zones start requiring nails you MUST restart and destroy all residential plots and begin from Step 1.